Sometimes you need to make an AJAX call from your MVC view to perform some server side actions on user changes. You may then want to return some calculated data in a partial view so that you can update the view as presented to the user. What if you have modified data in more than one partial view? An application I worked on required some server side calculations that updated both data in a table (one partial view) and summary data displayed in the footer of the page (a second partial view). I would not want to make two separate service side calls to update the two partial views, so I looked into a mechanism to allow me to return the two partial views in the response from the server side call. I realised that if I could package the two partial view responses into a single object, I could pass this to the client in the response, then use my client side script (JQuery in my case) to unpack the responses and update the two partial views. Note that my two partial views (“_TotalValues.cshtml” and “_SummaryValues.cshtml”) both use the same model in my example as the view that they are displayed on (MyModelView). I don’t believe this would be a necessary restriction though. This is a very simplistic implementation, with no error handling, just to show the technique. If you have a form that has multiple tabs, or other display sections, you might have a need to display data that is entered on one part of the form on other parts. For example the first tab could allow the user to enter a name, this name may then be displayed as read only on other tabs. There are various methods to do this, but if the read only display is positioned in different parts of the form and in more than one place, you might want to have separate elements for each display. This little bit of jQuery will allow any changes to the data to be automatically copied to all of the relevant read only display elements. // be the same as the model property name e.g. // <textarea class="form-control isDisplayElement Description"
Add the “hasDisplayElement” class to all editors that will need to update corresponding display elements elsewhere on the form. Also make sure that all the editor elements have an id. Add the class “isDisplayElement” followed by the id of the relevant editor element to all of the display elements. By including the id of the editor as a class on the display element, the jQuery script will be able to find the correct display elements whenever a edited value is changed. N.B. The updateElementDisplay method uses the jQuery val() method to update the display elements. Therefore, you need to ensure that any elements that have the “isDisplayElement” class support val() (such as Input elements). If you want to use other elements, such as div, you will need to modify the updateElementDisplay method to detect these and use text() instead. Fruit Mix Up is a sliding tile puzzle with a difference. Unlike other puzzles that have an empty space to move around, Fruit Mix Up gives you the full picture. You slide the rows and columns on the game table to move the tiles, as a tile moves off the end of the game table; it reappears on the opposite side. This makes the game a physically impossible version of the classic cube puzzle (such as the Rubik’s Cube), which could only exist on a game machine. Like the cube, you need a strategy to move the tiles without disturbing the ones that are already in place. The challenge gets harder when you only have 2 or 3 tiles left in the wrong place, how do you get these in the correct place without moving the others? It might look impossible, but every game has a solution. In fact, you start the game with the picture complete, and watch while a number of random moves mix it up. If you have really sharp eyes, you might be able to retrace the moves and complete the puzzle really quickly. Fruit Mix Up has 9 different fruit images, one is chosen at random for every new puzzle. It also has 6 levels of puzzles, with increasing numbers of tiles. In the first four weeks since release, Fruit Mix up has had over 5,000 installs across all the markets, and is being played by over 300 players every day. Many of these players are returning users, players who love sliding tile puzzles love the original and challenging game play. Fruit Mix Up is the second Android game developed by Rhames Games. Rhames Games is a one man indie games developer, based in Brighton, UK. Robin Hames, the one man developer, has over 20 years of post graduate software engineering experience, and he is a Chartered Engineer and corporate member of The Institution of Engineering and Technology in the United Kingdom. Recently I was working on a project that used more than one Entity Framework model to access different sections of the same database. The Entity Framework models were created using Model first to create edmx model files. The problem with this approach is that the connection string are unique to each model, as they contain model meta-data. This means that we have the same database connection string in several places. Using our IoC container, we can create a dependency that will inject a single database connection string into each database context, which means that we can have a single database connection stored in our config file (web.config or app.config). As the provider and database connection string will be the same for all Entity Framework models, we can pass these into the EntityFrameworkConnectionBuilder as constructor parameters, which will be set by the IoC container. The implementation of the createEntityFrameworkConnection method uses the EntityConnectionStringBuilder to build the correct entity framework connection string based on the supplied model name and the injected database provider and connection string. We will use our IoC container to inject the IEntityFrameworkConnectionBuilder object into our Entity framework DB context classes. As the context classes are automatically generated by the Entity Framework model, we do not really want to manually alter these, as any changes would be lost if the model was regenerated. We can use partial classes to get around this problem. When you created the model, you would have specified the EntityContainerName property. A class that inherits from DbContext will have been created in the model as the custom context for your model. In the same namespace, we can create a new class with this same name, and mark it as partial so that it will be merged with the generated class when compiled. This class contains a constructor for the context that receives an instance of the IEntityFrameworkConnectionBuilder interface and the relevant model name. This constructor will be called by the IoC container, and the parameters will be resolved automatically (this will be described later when we configure the IoC container). The connection string for the context is passed to the base DbContext by calling the base constructor and passing in the connection string generated from the IEntityFrameworkConnectionBuilder.createEntityFrameworkConnection(modelName) method. Typically the Db Context objects are created with a using statement, to ensure that they are dispose of correctly when finished with. However, we need a mechanism to create our context objects by resolving them through our IoC container so that the IEntityFrameworkConnectionBuilder object and model name may be passed to it, via the new constructor that we created. As we are going to use castle Windsor, we can make use of the Typed Factory Facility. Wherever we are making use of the DbContext (e.g. a repository, a unit of work, or some other pattern), we can inject the IEntityFrameworkContextFactory and then use this to create our DbContext objects. Note that we are not calling the Release method from the factory, as in this case the context objects will be created with a transient lifecycle, which I believe means that they will be released when the using statement completes. The final step is to register our various interfaces and classes with Castle Windsor. In our root project, we can create an installer. The mechanism to run this installer will depend on the type of project, but for example in an ASP.NET MVC project, it would be installed from the Application_Start event in Global.asax. In this installer, we are first registering the IEntityFrameworkConnectionBuilder interface with its implementation, and retrieving the database connection string from the configuration with the name MyConnectionString. We are also passing the provider type, which in this case is System.Data.SqlClient. Next we register the IEntityFrameworkContextFactory as a Typed Factory. Finally, we register all of the Entity Framework context objects. It is important that the correct model name is configured here, as this will be passed to the database context. To check what the model name should be, when you created the Entity Framework model, a connection string will have been created in the configuration file, this will have the model name embedded in it. It may be that an existing project, or team, makes heavy of ASP.NET controls and are not comfortable with the transition to MVC. An alternative pattern, which provides the same loose coupling as MVC, is the Model View Presenter (MVP). This article describes a simple implementation of this pattern using ASP.NET. This structure allows the Presenters to interact with views via View Interfaces, which decouples the Presenter from the actual view implementation. 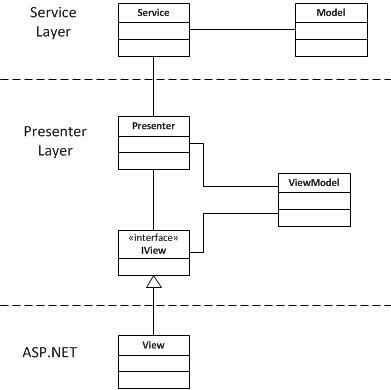 This means that the Presenter layer can perform all presentation and navigation tasks without any dependency on the actual UI technology being used (ASP.NET in this example). This makes code easier to unit test and should also allow code to be ported to a different UI framework more easily. This contains all of the Presenters and View interfaces. Typically this layer would be associated with the Model or domain layers, although in this simple demonstration, these lower layers are not implemented. This is the top level layer, containing the actual UI. It is an ASP.NET project which references the Presenter project. It is only this layer that has references to System.Web and the associated libraries. This layer also contains a reference to the Castle Windsor IoC container. This is an implementation of the Loosely Coupled Cache Provider library. See https://rhamesconsulting.com/category/cache-provider/cache-provider-part-1/ for further details on this. I find, particularly when using an IoC container such as Castle Windsor, creating base interfaces for other interfaces / classes to implement is a good first step. These base interfaces can allow registration by convention in the IoC container, and can also be useful as generic constraints. All Presenters will be associated with a view interface, therefore the IPresenterBase interface has a generic type that is constrained to be an IViewBase implementation. It also contains a single method that will be used to set up the presenter and run any tasks. It may be that this should really be split into two separate methods to allow the timing of the Run() method to be changed. One area that constantly seems to cause problems in a MVP implementation is how to implement navigation between views. As all logic, include navigation should be decoupled from the web front end, we need a mechanism to navigate at the Presenter level. However, navigation in ASP.NET is carried out by calling Response.Redirect or Server.Transfer. Obviously, the decoupled Presenter layer has no knowledge of these mechanisms. A simple method (with some restrictions) to handle navigation is to create a new interface, IViewRedirector. Presenters will be able to use this interface to request navigation to another view. They will also be able to pass parameters in the form of a view model to the next view via this interface. This interface provides two methods for redirecting to another view, one with no parameters and one with a ViewModel parameter. The ViewModel parameter method is used to pass data to the next view. The interface also contains a method to retrieve data passed to the view in the form of a ViewModel. There is currently no type checking against ViewModels in this simple interface, so care would be needed to ensure that a call to getData() requests the correct ViewModel type. All Presenters will need to be associated with a View instance, and will also require access to the ViewRedirector. Therefore, common code for to provide this can be abstracted out into a base class, which will implement IPresenterBase and from which all Presenter concrete classes will inherit. /// This has public acces to allow the instance to be injected by the IoC container. This PresenterBase contains a protected reference to the view object that a Presenter is associated with, this is initialised by the RunPresenter(View) method, which also calls the virtual RunPresenter() method. This RunPresenter() method can be overridden in the concrete Presenter classes to perform any necessary tasks. The PresenterBase class also contains a IViewRedirector property, which will be injected by the IoC container. I used property injection here, rather than the generally more preferred constructor injection, because constructor injection would require all concrete Presenter classes to implement the same constructor. Now that we have our base interfaces and classes in place, we can look at implementing the sample project. For this simple demonstration, I will create two views, one to allow the user to enter a name, and the second to display this name. The view interfaces are created in a Views folder in the Presenter project. This view contains two methods. The getFormData() method will be used by the Presenter to retrieve data entered into the view by the user. The setSubmitAction(Action) will provide a callback method from the Presenter, which will be called when the user submits the form. A ViewModel is associated with the View and used to retrieve data for the Presenter. This ViewModel is used to retrieve data from the InputView view. The IDisplayView view interface is used to display data back to the user. This view also contains two methods, setFormData() will allow the Presenter to pass data to the view for display. The setSubmitAction(Action) allows a callback method in the Presenter to be associated with the submit action from the view (this will not actually submit any data, as the view does not have any “get” methods, but it will allow us to navigate back to the input view). This view also has a ViewModel, which is used to pass data back to the view from the Presenter. This actually has the same properties as the InputViewModel, however it is good practice to give each View its own ViewModel. The DisplayViewModel also has an explicit conversion method to allow an InputViewModel to be cast to a DisplayViewModel. This cast will be used when navigating from the InputView to the DisplayView. Now we have the View interfaces in place, we can code our concrete Presenter classes. These are contained in the Presenters folder in the Presenter project. This presenter is associated with the IInputView interface. The onSubmit method in the InputPresenter will perform the task of reading the submitted data and navigating to the DisplayView when the user submits the form. The RunPresenter() method is used to set the submit action on the View. The onSubmit() method then calls the getFormData method on the view to read the entered data and then calls the viewRedirect.Redirect() method to navigate to the IDisplayView view. IDisplayView will expect to receive data in a DisplayViewModel object, so the inputFormData is cast to DisplayViewModel in the Redirect call. This cast will use the explicit conversion operator defined in DisplayViewModel. The DisplayPresenter is associated with the IDisplayView interface. The DisplayPresenter performs the task of passing data to the view in the RunPresenter() method. It calls viewRedirector.getData() to read the DisplayViewModel object that was passed from the InputPresenter, and calls the setFormData() method on the view. The onSubmit method just navigates back to the InputView, using the overload of viewRedirector.Redirect that does not pass any data. This completes the Presenter project. We have configured our Presenters and View interfaces to read data, navigate, and display data, but as of yet we have not committed ourselves to ASP.NET. The ModelViewPresenter.Demo.Web project in the sample code is the root project for the solution, and is the only project that has any references to System.Web and other ASP.NET libraries. In this project we need to provide our view implementations. We also need to provide an implementation for the IViewRedirector interface. We will use Castle Windsor as an IoC container to inject the dependencies. The ASP.NET web project also has implementations for the various CacheProvider interfaces, which are contained in the WebCacheProviders folder. This article does not cover these implementations, as the CacheProvider is covered by another article. There is also a Windsor installer to register the cache provider classes in the WindsorInstallers folder. The implementation of the IViewRedirector interface is located in the MVP folder in the web project. The ViewRedirector class uses Response.Redirect to navigate to the requested view. Server.Transfer could also be used if required. The decoupled nature of the MVP framework means that if a decision was made to change to Server.Transfer, only the ViewRedirector class would need to be modified. There are not a myriad of Response.Redirect calls to locate and change, as is often the case in traditional ASP.NET applications. When a request is made to redirect to a view interface, the pathToView helper method is called to resolve the view interface into the relevant URL for the Response.Redirect method. This method uses the CacheProvider to check if a path for the requested view interface has already been resolved and stored in the cache. If it has not, the path is resolved by using the Windsor container to resolve the view interface into a concrete view object. The type name of this object will give the path name, assuming that all views are located in the View folder in the web project. If a different mechanism is required, because, for example, views are located in different folders, only the pathtoView helper method will need to be modified. This again is a benefit of the decoupled design. The other responsibility for the ViewRedirector class is to handle the transfer of data from the request to the new view. The sample implementation uses the HttpContext Session object to do this. Again, this may be changed if required by just editing the ViewRedirector class (for example if Server.Transfer was used instead of Response.Redirect, the data could be stored in the HttpContext items collection). Whenever a view is displayed, we need to resolve the relevant Presenter for the view, and make sure the RunPresenter() method is called. The easiest method to do this is to call a factory method from the page Load() event for each view implementation. This factory method uses the Windsor container to resolve the concrete Presenter class for the specified view interface. It also passes the actual view instance to the presenter object when it calls the RunPresenter() method. It would be nice if we could use Castle Windsor to resolve the view object for us (in a similar manner to how Controllers can be resolved in a MVC application), but ASP.NET does not give us any easy hooks into this mechanism (it may be possible to make use of a HttpHandler to resolve the view, but this is out of scope for this simple example). The view implementations for our two view interfaces (IInputView and IDisplayView) are created as ASP.NET web forms (aspx files). The code behind file is then modified to add the relevant interface to the class to indicate that the aspx page implements the relevant interface. The web form for the InputView contains two server controls, a text box and a button. The button is wired up to the btnSubmit_click method in the code behind class. This method just calls the onSubmit callback method in the Presenter, which is setup during the Presenter initialisation by the setSubmitAction method on the view interface. The getFormData() method on the view interface will then just read the data from the text box control and load this into an instance of the InputViewModel class. The final important step is to call the PresenterFactory.getPresenter method in the Page_Load event to create and initialise the correct Presenter object. The web form for the DisplayView contains two server controls, a label and a button. The button is wired up to the btnSubmit_click method in the code behind class. This method just calls the onSubmit callback method in the Presenter, which is setup during the Presenter initialisation by the setSubmitAction method on the view interface. The setFormData() method on the view interface will then just extract data from the instance of DisplayViewModel, which is passed as a parameter to the method, and load this into the label control. The final step is to create the Windsor installers for the relevant types and run these installers when the web application starts. The web project has a folder called WindsorInstallers, which contains two installers. The CacheInstaller is used to register the CacheProvider implementations, which are outside the scope of this article. The MvpInstaller registers all of the MVP related classes, which are Presenters, Views and the ViewRedirector implementation. All the views and presenters are registered with the Windsor container by convention, using the IViewBase and IPresenterBase interfaces. The implementation of the IViewRedirector interface is registered explicitly. The final step is to modify the Global.asax.cs file to run the Windsor installers on start up. The Windsor container is made available as a public static property in Global to allow the PresenterFactory and the ViewRedirector classes to access it and resolve views and presenters. This post adds SQL Cache Dependency support to the loosely coupled .NET Cache Provider that I described in the previous post (https://rhamesconsulting.com/2012/09/14/loosely-coupled-net-cache-provider-using-dependency-injection/). The sample code is available on github at https://github.com/RobinHames/CacheProvider.git. Each time we want to apply a cache dependency to a call to fetch or cache a data item we need to supply an instance of the relevant dependency implementation. This suggests an Abstract Factory will be useful to create cache dependencies as needed. We can then use Dependency Injection to inject the factory into the relevant consumer. Castle Windsor provides a typed factory facility that will be utilised to implement the cache dependency abstract factory (see http://docs.castleproject.org/Windsor.Typed-Factory-Facility-interface-based-factories.ashx). First I created a set of cache dependency interfaces in the domain layer, which can be used to pass a cache dependency into the cache provider. The ICacheDependency interface is simply an empty interface that is used as a parent for the specific cache dependency interfaces. This will allow us to place a generic constraint on the Cache Dependency Factory, and will give us a type that can be passed into the relevant Cache Provider methods. The ISqlCacheDependency interface provides specific SQL caching details, such as a Sql Command or a database connection and table. It is the concrete implementation of this interface that will be created by the factory in passed into the Cache Provider. If we want other types of cache dependencies, such as by key or file, interfaces may be created to support these (the sample code includes an IKeyCacheDependency interface). Next I modified the exisitng ICacheProvider<T> interface so that cache dependencies may be passed into a Fetch method call. I did this by adding two overloads to the existing Fetch methods, which take an IEnumerable<ICacheDependency> parameter (the IEnumerable allows more than one cache dependency to be included). I also added a method to create cache dependencies. This means that the implementation of the Cache Provider will require a dependency on the Cache Dependency Factory. It is pretty much down to personal choice as to whether this approach is taken, or whether the Cache Dependency Factory is injected directly into the repository or other consumer of Cache Provider. I think, because the cache dependency cannot be used without the Cache Provider, placing the dependency on the factory into the Cache Provider implementation is cleaner. Next I created the interface for the Cache Dependency Factory in the domain layer. I used the ICacheDependency parent interface as a generic constraint on the create and release methods in the factory interface. Now the interfaces are in place, I moved on to the concrete implementations. The concrete implementation of ISqlCacheDependency will need to provide an instance of System.Web.Caching.SqlCacheDependency to the Cache Provider implementation. Unfortunately this class is sealed, so I cannot simply inherit from this. Instead, I created an interface called IAspNetCacheDependency that will provide a Create method to create an instance of the relevant System.Web.Caching Cache Dependency type. This interface is specific to the ASP.NET implementation of the Cache Provider, so it should be defined in the same layer as the concrete implementation of the Cache Provider (the MVC UI layer in the sample code). Next, I created the concrete implementation of the ISqlCacheDependency interface. This class also implements the IAspNetCacheDependency interface. This concrete implementation also is defined in the same layer as the Cache Provider implementation. The ICacheProvider interface is implemented by the CacheProvider class. This implementation is modified to include the changes to the ICacheProvider interface. (The –t option should be repeated for each table that is to be made available for cache dependencies). (obviously the name and connection string name should be altered as required). This will add a dependency of the “Blogs” table in the database. The data will remain in the cache until the contents of this table change, then the cache item will be invalidated, and the next call to the GetAll() repository method will be routed to the parent repository to refresh the data from the database. I have recently been reading the excellent book “Dependency Injection in .NET”, written by Mark Seemann, which I strongly recommend. Reading the ideas around Dependency Injection made me realise that the Cache Provider code I wrote about earlier (see http://geekswithblogs.net/Rhames/archive/2011/01/10/using-the-asp.net-cache-to-cache-data-in-a-model.aspx) could be refactored to use Dependency Injection, which should produce cleaner code. Separate the cache provider implementation (using the ASP.NET data cache) from the consumers (loose coupling). This will also mean that the dependency on System.Web for the cache provider does not ripple down into the layers where it is being consumed (such as the domain layer). Provide a decorator pattern to allow a consumer of the cache provider to be implemented separately from the base consumer (i.e. if we have a base repository, we can decorate this with a caching version). Although I used the term repository, in reality the cache consumer could be just about anything. Use constructor injection to provide the Dependency Injection, with a suitable DI container (I use Castle Windsor). In the sample code, the key interface is ICacheProvider, which is in the domain layer. This interface contains two methods to retrieve data from the cache, either as a single instance or as an IEnumerable. the second paramerter is of type Func<T>. This is the method used to retrieve data if nothing is found in the cache. The ASP.NET implementation of the ICacheProvider interface needs to live in a project that has a reference to system.web, typically this will be the root UI project, or it could be a separate project. The key thing is that the domain or data access layers do not need system.web references adding to them. The FetchAndCache helper method checks if the specified cache key exists, if it does not, the Func<U> retrieveData method is called, and the results are added to the cache. Note that the cache provider is registered as a open generic type. These two repositories are implemented in the DataAccess layer, using Entity Framework to retrieve data (this is not important though). One important point is that in the BaseRepository implementation of IRepository, the methods are virtual. This will allow the decorator to override them. The BlogRepository is registered in a RepositoriesInstaller, again in the MVC UI project. I used a Decorator pattern to consume the cache provider, this means my repositories follow the open/closed principle, as they do not require any modifications to implement the caching. It also means that my controllers do not have any knowledge of the caching taking place, as the DI container will simply inject the decorator instead of the root implementation of the repository. The first step is to implement a BlogRepository decorator, with the caching logic in it. Note that this can reside in the domain layer, as it does not require any knowledge of the data access methods. // hard code 5 minute expiry! I inject into the repository the ICacheProvider<Blog> implementation, via the constructor. This will make the cache provider functionality available to the repository. I inject the parent IBlogRepository implementation (which has the actual data access code), via the constructor. This will allow the methods implemented in the parent to be called if nothing is found in the cache. I override each of the methods implemented in the repository, including those implemented in the generic BaseRepository. Each override of these methods follows the same pattern. It makes a call to the CacheProvider.Fetch method, and passes in the parentBlogRepository implementation of the method as the retrieval method, to be used if nothing is present in the cache. This is all that is needed. Now if the consumer of the repository makes a call to the repositories method, it will be routed via the caching mechanism. You can test this by stepping through the code, and seeing that the DataAccess.BlogRepository code is only called if there is no data in the cache, or this has expired. The next step is to add the SQL Cache Dependency support into this pattern, this will be a future post. The UpdateNameModel will be used to retrieve data submitted by the Ajax method call. It is this model that the Json object will bind to. The NameResponseModel class is used to pass information back to the UI via a template view. This template simply displays the contents of the associated NameResponseModel object. This action takes a UpdateNameModel object as a parameter and simply copies this into a new instance of the NameResponseModel. It then returns the display template as a partial view. I’ve added a div with the Id=”Response”. This will be used to display the partial view following an Ajax update. When the “Update” button is clicked, the click event creates a Json object with the contents of the “Name” text input and an array of integers. Note that the names of the Json items must match exactly the names within the data model that the Json will be bound to. MVC3 will quite happily handle complex data binding, so the array of integers will be bound successfully to the Numbers IEnumerable<int> parameter in the UpdateNameModel class. Other points to note are the contentType parameter of the Ajax call is set to ‘application/json; charset=utf-8’. This indicates that the parameter passed by the Ajax call will be a Json object. The Json object itself needs to be converted to a string, JSON.stringify will perform this function for us. The dataType parameter in the Ajax call is set to ‘html’. This indicates that the data returned by the server is expected to be html (the rendered partial view in this case). The success callback then simply loads this returned html into the “Response” div. Hope this helps somebody! It took me a while, and a lot of googling, to figure it out!